You fire up Skype and suddenly everything on your computer is radically quieter. 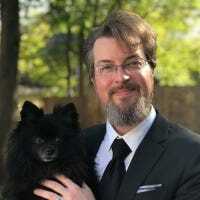 While that’s great for ensuring you don’t blast your video conference partners with music it can also be a detriment when it mutes sounds you need to hear. Read on as we fix the Skype silencing issue. Lately I’ve been using Skype to talk to my nephew while we play video games together. It works pretty well as a voice chat channel while we’re playing, but there’s one super annoying feature that I can’t seem to fix. Everytime I start Skype, Skype seems to nearly mute all other audio (every audio source but Skype is probably only 10-20% its previous volume). I’ve looked everywhere in the Skype menus, but I can’t find a single thing that indicates any sort of control over this volume-dampening effect. I can manually open up the Windows Volume Mixer from the system tray and fiddle with each individual volume control for each individual audio source but that’s 1) a huge pain and 2) only temporary as the second I shut down Skype and start it again then all the volumes are automatically decreased. What gives? How do I fix this? The reason you can’t find any setting in Skype to control the sweeping volume adjustments that occur when you run Skype concurrently with other sound-producing apps (like your video game) is because it isn’t actually Skype that’s performing the adjust. Windows automatically recognizes Skype as an audio/video chat communication tool and, by default, assumes that when the communication tool is active that you would like all the other system sounds to be hushed in order to both hear your partner more clearly and not have those sounds blast your microphone and create a bunch of interruptions and background noise. In your application, however, you likely want to hear the game sounds (wearing headphones to isolate the sounds from the microphone is ideal here) and the person you’re chatting with. In order to adjust things we’ll have to head into the Windows Control Panel. Navigate to Control Panel -> Hardware and Sound -> Sound and then select the Communications tab (you can also jump to the Sound settings by typing mmsys.cpl in the run dialog box). 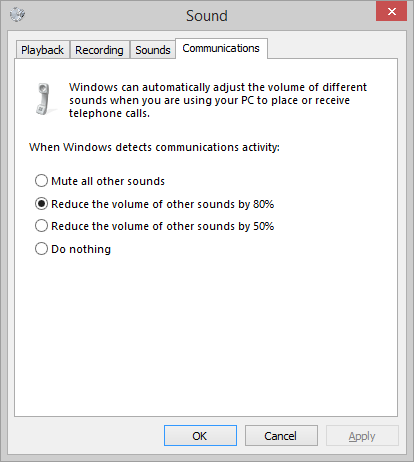 By default Windows automatically adjusts the volume of other sounds by 80% (your guess that the sounds were 10-20% their prior volume was quite a good one). You can select to have the sounds only reduced by 50%, to be completely muted, or for Windows to do nothing at all. In your situation it’s ideal to set it to do nothing at all and then, if you find any particular sound is too loud, you can open up the Volume Mixer and make small adjustments as necessary.